Hello. It's Cari with you today. I'm so excited to share a project with you that I created using the beautiful Vintage Bliss collection. I am in love with this collection. Absolutely smitten! I put all the pages together by cutting up some of the 4x6 Journal Card Elements and some patterned papers (to 4x6 size). Before I filled up the pages of my album I bound it altogether with some antique o-wires and my Zutter Bind-it-all machine. I printed my photos out in a 2" x 3" size and converted them to black & white for a consistent feel throughout the album. I used lots of fun embellishments (stickers, flowers, buttons, ribbons, twine, etc). I am a foam square addict so I most definitely used them on some of the stickers to add a variety of depth throughout the album. I used one of the 4x6 transparencies and placed a round sticker on the front and another one on the back. Here's the inside pages #7-12. I used one of the Sn@p! Pockets and tucked in a 2x3 journal card (which I'll write something on later). And a few more close-up pictures. I hope that I have inspired you with my creation today. I lined up the photo with one of the artistic journaling cards and went from there in matting with a patterned paper. The blue 'wavy' piece at the bottom was traced from a template by Kiwi Lane Designs. Along with a few die-cuts clouds and buttons from my stash, I created a trio of flags by attaching the SN@P stickers to a wooden toothpick and wrapping around the excess. I attached them to the page by adding small foam squares to the back of each flag. We had a vintage typewriter available at a retreat that I attended this past weekend...it came in sooo handy when I got ready to journal on one of the SN@P journal cards! I just tucked one of the pockets behind my photo and then slid the card inside. For the card I went with a simple design and color scheme. I'm really loving the SN@P Small Dot and Striped papers together...can't you tell? :) I wrapped a light pink doily around the bottom of the pocket and glued in place. To the top, I layered two different colored SN@P sticker tabs together. A couple of embellishments added to the center and my card was complete! Glad you've stopped by today! Hi there! It’s Yuki here with you. Today, I have a project to share using new Urban Traveler collection with you. I made this travel album with a 6x8 SN@P! binder last year. I had a chance to get more photos lately, so I have decided to make more pages and insert them in my album. The Urban Traveler collection is perfect to document your travel memories in a short time! Have you seen the Simon Says Stamp blog? It’s a wonderful blog and full of inspirations! My cards using Simple Stories products were introduced in their blog, check them out! Hi all, it's Natasja here today. Today I want to share this layout with you which I created in record time. It only took me 20 minutes!! Really it did, I couldn't believe it my self! Never have I finished a layout in this short amount of time and I am sure I can only do it using those amazing Simple Stoeries releases! I used the lovely new "Urban Traveler" release for it. Hope you like my layout! I had some chipboard banner pieces in my stash that I covered in the Vintage Bliss dictionary paper (by the way, the Simple Basics papers are so perfect for backgrounds). I also pulled out the cardstock sticker and added some embellishment here and there. I should also mention that the "eggs" were cut from the 6x6 paper pads. The smaller pattern designs were perfect! Since Easter will be here before we know it, I think I finished this banner just in time to hang up and enjoy and get ready for that Easter Bunny's visit! Thanks for popping by the blog today! Hello everyone! I don't know about you but I am SO ready for spring to finally get here and not just on paper. It's actually snowing outside right now! In order to try and chase these colder temperatures from my mind, I decided to play around with Vintage Bliss- the perfect collection for spring with its bright and fun colors! I had originally fussy cut a bunch of the cute butterflies from the Be Happy (#3007) patterned paper and wanted to use one as a focal point. With just a simple circle, some pop dots and a cute saying, this card came together quickly! A little gem on the butterfly adds a touch of sparkle and a lot of interest. My next card also has a butterfly, but instead of being backed by a circle, I used a diamond. This card measures 7" x 3.75" and would be a great place to stash some money or a check for a gift. The sentiment is so encouraging and I think works well for a graduate or someone leaving the nest. The last card uses my favorite patterned paper from Vintage Bliss, Spread Sunshine (#3006), though I used the version from the 6x6 pad for a smaller scale pattern. The 'so very sweet' is as cardstock sticker, and I started with that element to build the rest of the card. I hope these cards and Vintage Bliss help chase the winter blues away, at least until the sun actually starts to shine! Good morning! Cari here sharing some layouts with you today. When I received the Vintage Bliss collection I was in complete awe. Now you must understand one thing, when it comes to scrapbooking I'm not normally a 'pastel' kind of person. Those aren't the colors that catch my eye. However, this collection most certainly did. The shades, color combinations (especially that turquoise my favorite color) really grabbed my attention. So I decided to create some layouts with the beautiful new release. The first layout that I want to share with you is called "Being Together". It's about my daughter & me. I used the chevron patterned paper (Laugh Lots) for my background. I love the colors in that pattern! I then cut up the 6x12 Page Elements (wood grain design) and adhered that to the right side of the page. I embellished with other patterned papers, 3x4 Journaling Card elements, 4x6 Vertical Journaling Card Elements and lots of stickers! I like adding dimension with pop dots so I've done some of that on this layout with the stickers. I also cut out the butterfly designs from the patterned papers (Be Happy and Wood/Butterflies). The second layout that I created, "This is Us", took me only 15 minutes to do! From printing the photos to adding embellishments. How fun is that?! I've never created a page in that amount of time ... ever! Simple Stories makes it so easy to create pages in no time. Just think of how quickly you could create an album with pages that take this amount of time! Wow! I just printed off 2x2 sized photos and adhered them on the page. I added some stickers and cut out some mini bingo cards from the 6x6 paper page. Added my title and voila! DONE! I also created this birthday card (for my daughter who will be 13 in a few months time). I used an oval template and cut out a window to reveal the cut-out numbers (from Give Love) and sticker on the inside of the card. Thanks for stopping by and I hope I've inspired you with the Vintage Bliss collection. Something that I absolutely love and appreciate about Simple Stories is that while they create products that are themed they really can be used for so many different types of stories and topics. I decided to use this collection to scrapbook these two photos of my middle son riding his bike. And really, this collection was a perfect fit with its bright colors and arrow motif. Since the pictures weren't so great I decided to print them at 3x4 and also converted them to black and white. Then I didn't have to worry about them clashing with all the colors on my page and was truly free to play with both the colors and patterns. I tend to be a flat scrapper, and so this is an easy way to add something special to a layout. I also backed the heart cutouts in the letters with red paper to help them stand out more in the design. If you like this shape you can find it in the Silhouette Online Store, here. I mentioned above that Simple Stories has a talent for creating amazing and versatile products. In the image below you'll see a few stickers from other collections including Awesome, Sn@p! and Sn@p! Life. I love how everything mixes and matches. Thank you so much for stopping by today! I hope you enjoy your day! Happy Tuesday! 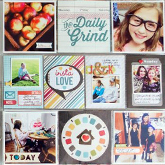 Tonya here to share a layout with you that uses the Take a Hike collection. My husband is a big hunting/fishing nut. I was so excited when his fishing buddy emailed these photos of him ('cuz let's face it, men just don't think to take photos of themselves!!!! ), and what better collection to use with this pictures?!!! My original plan was for that striped title piece to go vertical down the left hand side of the layout. However, once I had all of the machine stitching done and tried to place my photos I decided that I wanted to turn it (for those of you that are super sleuths you may have realized that the background paper is turned the wrong way, but too much work had been done to start over, so I went with it!). Used the stickers to create a little fishing scene along the bottom. Last summer I moved from the Sonoran Desert of Phoenix, AZ where we rarely see weather below 80 degrees to the northern Arizona pines, a mere 7000 feet higher in elevation. That meant new adventures and also new experiences - SEASONS - awaited. So, last week when we were enjoying sunshine and 60 degree weather, we were fooled into thinking winter was over (I have a foot and a half of snow to shovel out of my driveway as I type this). We loaded up the car and headed out to one of my favorite areas, Sandy's Canyon, which is also a section of the Arizona Trail. Cool, huh? I got a great shot of my daughter on the rim of the canyon that I was immediately inspired to scrap. The Take a Hike line was a perfect starting point with its greens, oranges, and rich woodgrains. I knew I wanted to play with the colors and patterns a bit, so I started by creating these square embellishments. I found a great print on Pinterest which inspired the embellishments, and I love the way they give visual interest without taking away from the photo. Next I played with the title a bit. I knew I wanted to use those amazing woodgrain alphas prominently. So, I layered them on top of one of the mini flashcard stickers. Finally I wanted some weight at the bottom of the layout, and I needed space for journaling. The "Field Notes" journaling block is cut from one of the 6x6 pad sheets. I love that those offer smaller versions of many of the 4x6 cards! I finished the layout off with some woodgrain strips stitched to the top and bottom of the layout. I love how all the elements came together! Hopefully this has inspired you to get out on the trail and seek out your own adventure! Oh, and to scrap it, too.